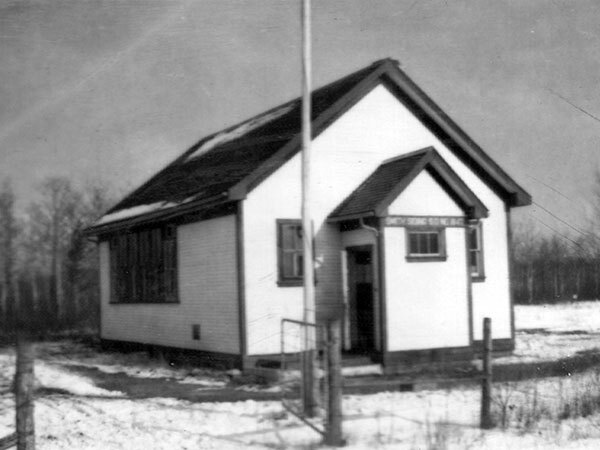 The Smith Siding School District was established formally in December 1916 and a one-room schoolhouse operated at SE27-13-9E in the Rural Municipality of Lac du Bonnet. Named for a siding on a since-removed Canadian Pacific Railway line, a three-acre school site was purchased on 25 May 1917, with a schoolhouse built in the fall of that year. Classes began before the year’s end. An $800 teacherage was built soon afterward. The school closed in the summer of 1964, after which students were transported to Buchanan School. In January 1968, the district was dissolved and its the catchment area was incorporated into the Agassiz School Division. The school building is no longer present at the site but a hedge of lilacs and the abandoned teacherage were still there as of 2015. Among the teachers of Smith Siding School were Mrs. M. M. Roch (1917-1918, 1928-1930), Miss Sansregret (1919), Olive Smith (1923), Plifford James Garvie (1925-1926), Alberta E. Jenkins (1927), Mrs. L. A. Brynelson (1927-1928), Albina Korman (1930-1931, 1932-1933), Lillian Nicholin (1931), Harrietta Agnes Higgins (1933-1934), Elizabeth Elkin (1934-1938), Leslie A. Hamilton (1938-1941), Mrs. Nellie Wold (1941-1942), Thomas Mackay (1942-1947), Susan Letandre (1949-1950), Richard Edward Gralk? (1950-1951), Gladys Wojciechowski (1952-1954), Joan Isabella Lang (1954-1955), Elven Bonikowsky (1955), Nazar Watcyk (1956-1958), Jarvis Podolsky (1958-1959), Elizabeth D. Parr (1959-1962), and Margaret Ann MacInnes (1962-1964). GR8461, A0233, C131-3, page 45. Trustee records regarding geographically remote schools directly administered by Department (E 0166), File 1847 - Smith Siding, GR1206, Archives of Manitoba. Trustee records regarding geographically remote schools directly administered by Department (E 0166), File 1847 - Smith's Siding - Permanent, GR1206, Archives of Manitoba. Departmentally appointed school trustee files (E 0034), Smith Siding School District #1847 - Minute Book, GR1629, Archives of Manitoba. Departmentally appointed school trustee files (E 0034), Smith Siding School District #1847 - Cash Book, GR1629, Archives of Manitoba. Manitoba School Records Collection, Smith Siding School District #1847 Daily Registers, GR9480 & GR0565, Archives of Manitoba. Manitoba School Records Collection, Smith's Siding School District #1847 Daily Registers, GR0565, Archives of Manitoba. This page was prepared by Nathan Kramer, Gordon Goldsborough, and Donna Marion.